Chinese New Year is right round the corner, taking place from February 5th until the 19th. 2019 marks the year of the pig, the twelfth animal in the Chinese zodiac, representing diligence, kindness, and generosity. This holiday is a great time to increase cultural awareness of the world around us in an educational and engaging way. Getting your kids involved with interactive activities with an oriental influence is a great way to educate in an entertaining way. For instance, a tangram puzzle. This ancient Chinese puzzle also known as the “seven pieces of cleverness” is used to construct geometric shapes. These can help your child develop problem-solving, mathematical and logical thinking skills. Other games to take part in include Mandarin words searches and vocabulary matching cards of Chinese New Year symbols such as dragons and lions. Also known as ‘facai yusheng (发财鱼生; prosperity raw fish salad)’, this is a popular dish during Chinese New Year in Singapore, served as an appetizer to symbolise “good luck” for the New Year. This is a great activity for all the family to get involved in and educate your child on Chinese food preparation. This vibrant dish includes raw fish, various vegetables, sesame seeds, peanut crumbs, an array of spices and plum sauce. Finally, the toss! Everyone stands around the dish with their chopsticks and tosses the ingredients into the air whilst shouting New Year’s phrases. Remember, the higher the toss, the more prosperity for the New Year! Watch our video from last year’s celebrations to see more. At White Lodge, we are dedicated to providing children with the opportunity to increase their knowledge and proficiency of Mandarin. Music is a great way to achieve this. There are many online resources showing popular Chinese New Year songs and rhymes your child can participate in. For example, Gongxi, Gongxi (Greetings, Greetings) which signifies the end of winter and Xinnian Hao (Happy New Year) which signifies the happiness of the season. One of the most anticipated activities of Chinese New Year for the kids are the vibrant and lively parades. Filled with musical performances, colourful costumes, floats full of mythical creatures and the cheers of the many people in attendance. This is definitely an immersive activity your child will enjoy! A pivotal part of Chinese New Year parades is the traditional dragon and lion dance. Dragons are a symbol of imperial China, believed to bring good luck and long life to all, whilst the Lion represents power, wisdom and superiority. 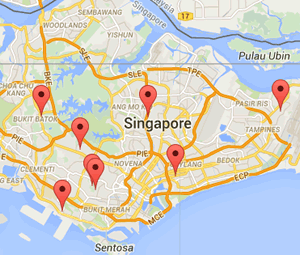 The main parade taking place this year in Singapore is Chingay, on February 15th and 16th at the F1 Pit Building. The River Hongbao is another key event which filled with fireworks and child friendly carnival attractions. Nightly stage shows at Kreta Ayer Square are also available and taking a stroll on Chinatown Walking Trail is great if your child wants something quieter. 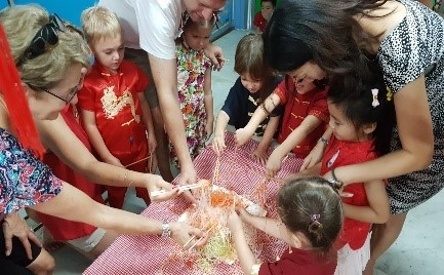 Another Chinese New Year activity for kids is to get them involved in arts and crafts. This is a great way for your child to express themselves creatively, use their imagination and develop their fine motor skills. Chinese calligraphy is a form of artistic expression of human language. 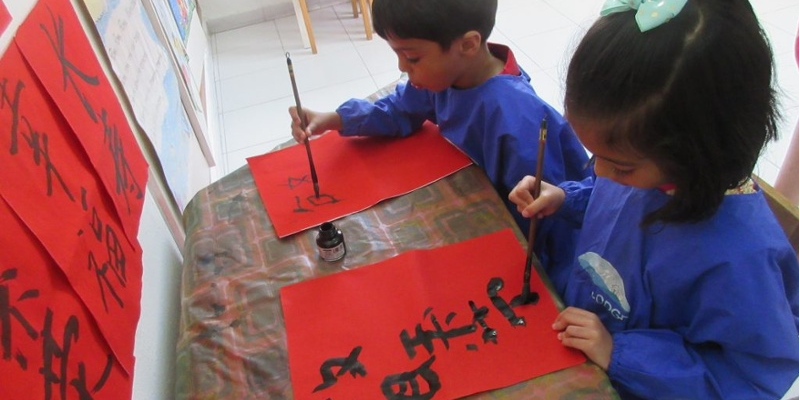 Your child can get involved in this by writing out their name or drawing popular Chinese symbols. The Lantern Festival indicates the end of the Chinese New Year celebration, falling on the 15th day of the first lunar month. Children participate in the festival by carrying their own paper lanterns filled with riddles, which can easily be made at home with domestic items. Check out a tutorial here. With all the planning and preparation that goes on during this period, Chinese New Year can be a stressful time, hence it is important to take time to wind down and relax. A great example of this is mindfulness colouring. By maintaining a focus, stress and anxiety is lowered and a meditative state can be achieved. There are many printable Chinese New Year sheets available online. These crafts can also be used as party decoration for your festivities, saving you costs! Happy New Year to all, may it be a time full of joy and prosperity. We celebrated Chinese New Year on Friday 1st February with a day full of activities and learning sessions. Don't forget to look at our video below to see what we've been up to at White Lodge. Get in touch with White Lodge today to help your child derive the greatest value, pleasure and fulfillment from their childhood! Subscribe to our monthly blog updates!